Taste test: These are quite good. 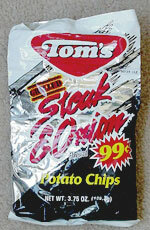 I'm can't say that they really taste like steak and onion, but they're not too salty and have a mild, tasty flavor that vaguely resembles steak and onion. I could eat a whole bag of these if I were really hungry. Another opinion: More oniony than steak. But not bad, they didn't ruin them by putting too much flavor powder on them, at least you can still taste the potato chip. 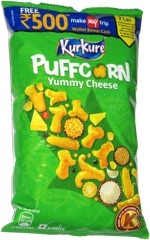 This snack was discovered by Jeremy at a convenience/liquor store near Reunion Arena, Dallas (before they tore it down).